There it was: Laboratorio Guiditta Brozzetti, the Guiditta Brozzetti workshop, a hand-weaving museum and school hidden inside the imposing church of San Francesco delle Dome in Perugia, Italy. I’d made an appointment to visit the studio months earlier, when I decided to travel to Perugia for a friend’s wedding. If I was going to travel that far, I definitely wanted to scope out textile-related landmarks in the area. Finding it wasn’t straightforward—when my GPS claimed we had arrived, it took us several minutes before we spied the faded sign directing us to the entrance. A diminutive pixie with close cropped gray hair and bright red lipstick greeted us at the door—Marta Cucchia. I wasn’t sure of her position. Curator? Manager? Teacher? I quickly learnt that she played all those roles and then some. Marta is a lovely strong woman, a doer, vested in her life’s work. Marta, like her mother and grandmother before her, follows in the footsteps of her great grandmother, Guiditta Brozzetti, working towards preventing old textile techniques from dying out. Guiditta Brozzetti used to collect traditional hand-woven textiles from the poor peasants in the Umbrian countryside. She helped supplement their meager incomes by selling the textiles in Perugia. Later, Guiditta Brozzetti opened a weaving school for women interested in learning a trade. She hoped her students would work towards continuing the Umbrian weaving traditions. Now, Marta and her students, like the students in the original school, use wooden four harness looms to replicate these same traditional textiles. Marta often uses patterns she reproduces from those depicted in old paintings. In addition, in order to bring the glorious medieval damasks back to life, Guiditta Brozzetti had transformed some of the school’s four harness looms into Jacquard looms, which were invented by Joseph Jacquard in 1801. Until 1800, the only way to create damasks and other complex patterns was by picking up threads by hand. 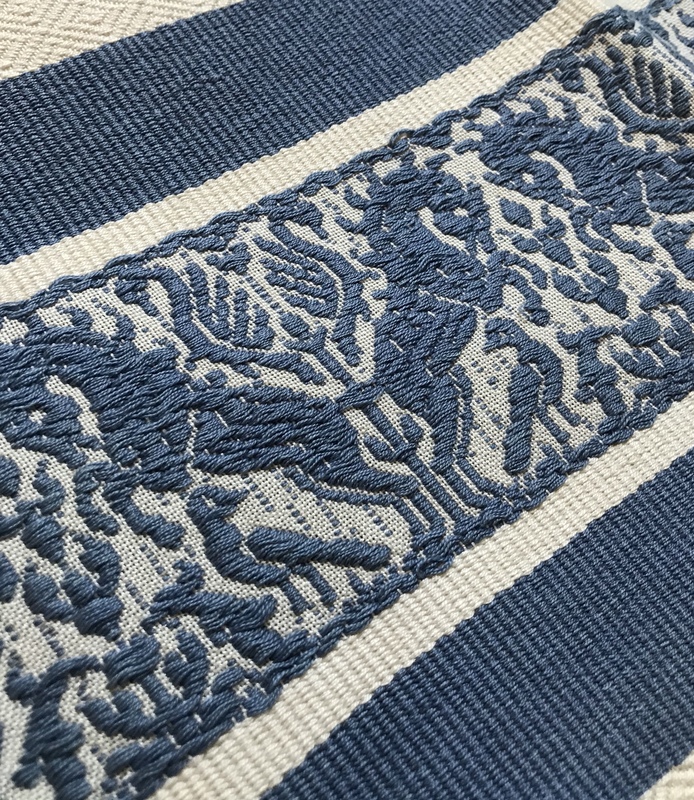 Jacquard’s invention automated the process, making these beautiful textiles available to a broader market. 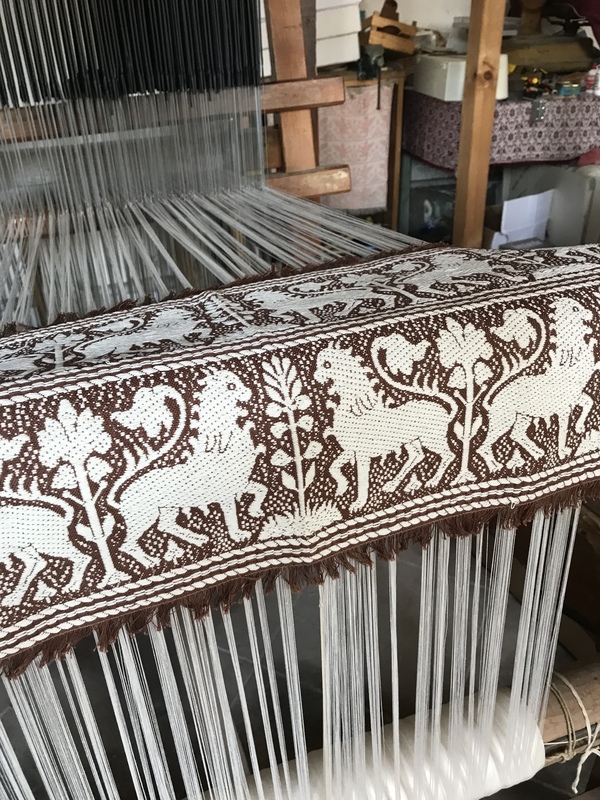 Marta uses old wooden Jacquard looms to weave stunning pieces, some depicting mythical creatures such as griffins or dragons, others covered with images of twining vines and other local flora. Like her great-grandmother, Marta teaches the techniques to students, hoping to prevent the art of damask weaving from falling into extinction. I was reluctant to leave. I had so much to learn from Marta. I could have spent hours there, talking with her (and oh! to attend one of her workshops—or to be an apprentice, even if only for a short while!). I consoled myself by purchasing two fabulous pieces. I rationalized going over my budget by telling myself that I’ll need samples when I write an article about my experience for my column “Textile Techniques from Around the World” in the WARP (http://weavearealpeace.org/) quarterly newsletter and the Fiber Arts Guild blog!